The Carroll County Genealogical Society, Inc. was founded in 1981 to stimulate interest in genealogy, to educate the membership and general public in proper and ethical methods of genealogical research, and to gather, record, and disseminate genealogical and historical information. CCGS supports two communities in this way. At home in Carroll County Maryland, CCGS offers resources and experience for our members and community to conduct their research examining family history and provide a place where people can come together to share and aide others in research. CCGS offers programs, speakers and special projects which encourage community participation and sharing. Across the nation, we offer distant researchers membership, local expertise and resources to aide them in their research, where branches of their family tree may have resided in Carroll County, Maryland. Through our wide collection of Carroll County specific books, resources and historical knowledge we want to encourage researchers to engage us and allow us to help breakdown that brick wall or provide information to assist you in your research. The Carroll County Genealogical Society meetings are held the third Monday of each month March through May and September through November at 7:30 p.m. at the Westminster Library, 50 E. Main Street, Westminster. Refreshments are served beginning at 7:00. Meeting announcements can be located under current events. The public is always welcome. When inclement weather forces closing of the Westminster Library, CCGS meetings are automatically cancelled. Members will be notified via Email or you may call the library at 410-386-4490 to verify status. CCGS will also notify WTTR 1470 AM if there is cancellation of any scheduled program or event. We will also post notification on our website's homepage if there are program changes. 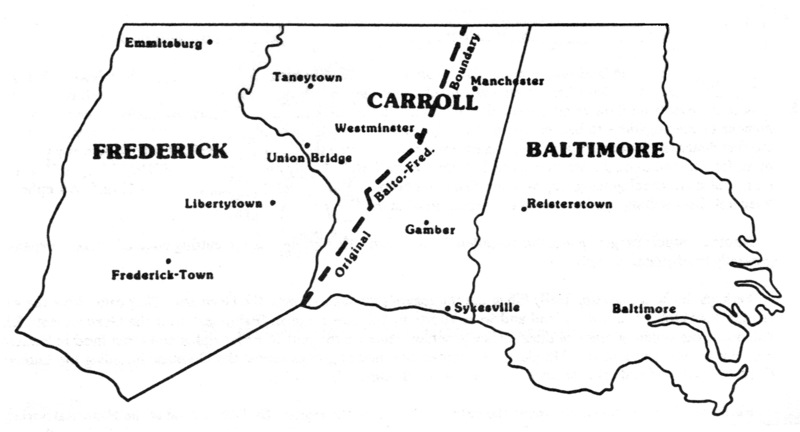 Carroll County was formed in 1837 it's boundaries created from Baltimore and Frederick Counties. It is an area rich in history and stories of families starting a new beginning. When the first settlers left the Atlantic Coast and the shorelines of the Chesapeake Bay heading west, past the first fault drop in the streams and rivers flowing from the mountains to the coast they found rich farmland and quick running streams to power mills before the Appalachian Mountains. It was here that many families had their first start in a wild frontier and it is from here that families would begin to migrate further west to the Ohio River Valley and southward towards Tennessee and Kentucky. Here on these pages the volunteers of the Carroll County Genealogical Society will strive to create the story of the many families who lived here, their history, their struggles and the records of their lives left behind for today's generations to recover and learn. Genealogy is just one facet in telling the history of our land and of our Nation. So as history intertwines with your family, rediscover your past and gain an understanding of how you reached your place in history today.